The BB Gun Shooting belt loop and pin can be awarded only by a BSA range-trained shooting sports director at a BSA-approved range. Scouts can earn gun-shooting recognition items only at council/district day camp, resident camp, or council-managed family camping programs. Gun shooting is not approved for the Cub Scout program outside of these defined venues. To be a BSA range officer, an adult must attend a three-hour training program conducted by a National Camping School-certified field sports director or National Rifle Association (NRA) instructor. Explain the rules of safe BB gun shooting you have learned to your leader or adult partner. Demonstrate to your leader or adult partner good BB gun shooting techniques, including eye dominance, shooting shoulder, breathing, sight alignment, trigger squeeze, follow through. Practice shooting at your district or your council camp in the time allowed. The BB Gun sports pin is earned by completing the camp BB Gun safety program and qualifying with a minimum of 60 credits in firing activities with a parent or adult partner, and with a certified range officer present. Explain the parts of a BB gun and demonstrate how to properly load the gun. Learn the correct scoring techniques for target BB gun shooting. Make a poster that emphasizes the proper range commands. Draw to scale or set up a BB gun shooting range. Show improvement in your shooting ability with an increase in scoring points. 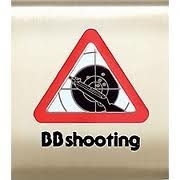 Help make a type of target for the camp BB gun shooting range. Show how to put away and properly store BB gun shooting equipment after use. Explain how to use the safety mechanism on a BB gun. Tell five facts about the history of BB guns. 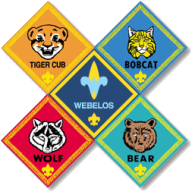 Certificates may be awarded to the Cub Scout or Webelos Scout at any time he achieves a level of marksmanship. It is possible to earn five certificates if every level of marksmanship has been accomplished. Instruction: Complete a basic BB gun marksmanship safety course. Shooting: Fire five groups of shots (three shots per group) that can be covered by a quarter, and then adjust the BB gun sight so that the group is centered on a bullseye. (No specific score is required.) Then fire the Marskmanship levels shown below.